The one port I was really excited to see on our May cruise was our first port of call, Kotor in Montenegro. It is a delightful UNESCO World Heritage site due to its stunning architecture, most dating back to time under the Venetian empire and brief period under the Ottoman rule. 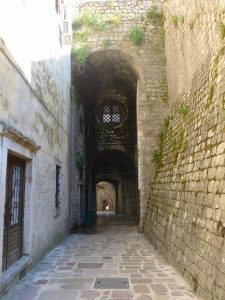 It is a port with both history and architecture similar to Croatia’s Split & Dubrovnik, two other larger Dalmatian ports I adore having visited them on other cruises in the past. 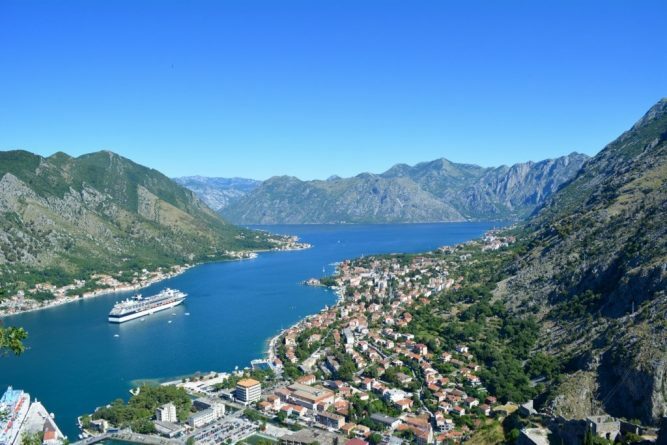 Kotor however, is located in this amazing bay quite unlike any other cruise port found in the region. 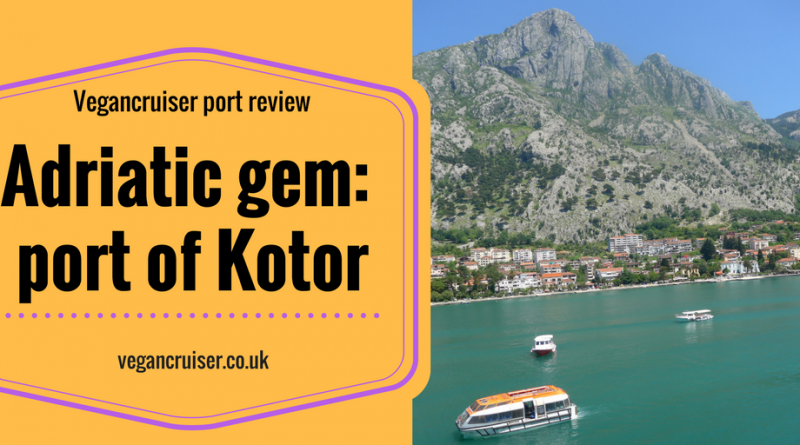 Sailing into Kotor can be likened to sliding into a Norwegian fjord. 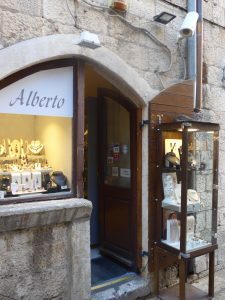 A stunning historical old town, surrounded by tall hills, but revealing a gorgeous fortified town built in Venetian style – instead of Scandinavian pines and wooden houses. 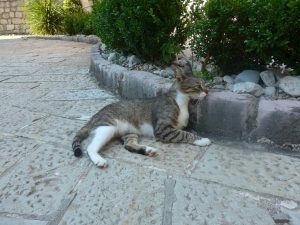 Kotor is strewn with beautiful architecture, narrow cobbled streets, and loads of gorgeous cats scattered about the place. Felines are always a bonus if you ask me. Second reason for my excitement was bringing a newbie onboard with me. 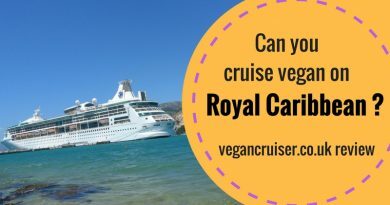 I was travelling with a friend who had never cruised before but had gotten curious after my enthusiastic Facebook posts. Thankfully she too had a great time, even in Kotor where it was rather hot on the day of our visit. I have since then discovered that the Gulf of Kotor has a humid subtropical climate. That would explain why us Scots girls were melting in May heat – even with my wide-brimmed hat to keep the sun away. Kotor itself is nestled in between of the tall mountains at the end of the winding bay. It is possible to hike from the old town all the way up to the St. John’s Fortress on the hills above. Here you will find beautiful views of the town beneath and the amazing ‘fjord’ where the cruise ships dock or anchor in the bay. 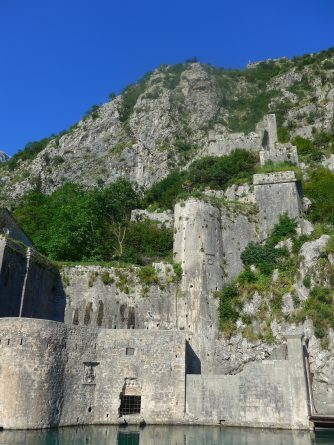 I had seen photos from the fortress and would have loved the steep climb. Unfortunately, my friend wasn’t well enough for such a hike. 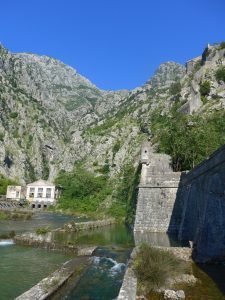 I hope to get back to Kotor soon and do the climb myself. 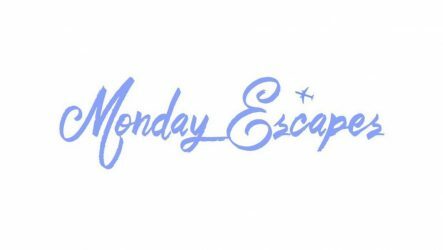 If you check out a blog post by John Roberts aka ‘In the Loop Travel’ you will understand why! John, whose post I linked to above has great photos from the hike, but none quite as high as the picture you see here. 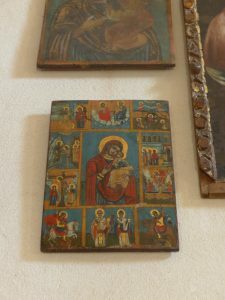 Many thanks to Silke at HappinessAndThings.com for letting me share her photo. But before you can go explore the old town or hike up the hill, you will need to get off the ship first. Tender tickets were due to be handed out just before lunchtime as Vision was entering the Kotor fjord. I went up 5 minutes early only to find a long queue of people who had turned up much earlier. Lesson learnt – If you want to get off the ship early on a tender day, queue up. Thankfully the line moved in a speedy fashion and ten minutes or so I had two tickets in my hand to get my friend and I off the ship. Tickets were to tender number 13 though -unlucky! We kept listening to the tender announcements and finally about 1,5h after our 2 pm anchor drop our tender number was finally called. The wait didn’t feel too long though, as we were enjoying the weather and stunning views from the deck. Plus we spent some time chatting with two lovely older ladies we had met at dinner the night before. They were friends too, but retired & widowed and now travelled the world together. Us ladies had booked separate tables for two, but much like on a Valentine’s Day evening in any restaurant, there wasn’t much between our ‘individual’ tables. The little space and no real privacy at dinner resulted in us four having a little bit of a nice dinner conversation that continued on the following afternoon as we waited for our tenders to be called. As we got our feet on the pier, local taxi drivers and tour guides were swarming around, offering various trips to nearby towns. Handy if you want to venture further but as we were here to see Kotor itself, all we had to do was to cross the road. In less than 5 minutes we were at the fortifications of the Old Town. 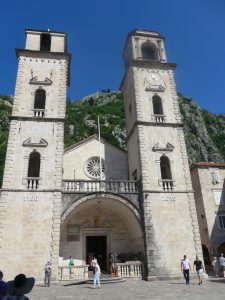 As we wandered through the small side streets of Kotor, we came across the Catholic cathedral also known as the Basilica of St Tryphone. This beautiful building dates all the way back to 1166, though has been greatly damaged by two earthquakes – and has had various repairs. Inside you’ll find a wonderful museum which gave us respite from the heat of the busy streets outside. 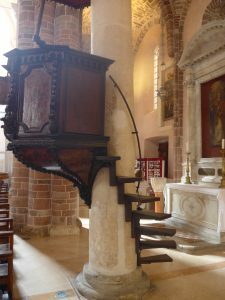 It displays stunning pieces of religious art, vestments and vessels and gives you a lovely aerial view of the square from the balcony pictured. 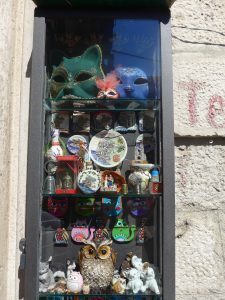 For a more detailed info on Kotor Cathedral/St Tryphone’s basilica, please see this other cruiser Raine’s blog entry on it. And how was Kotor as a vegan? Cannot really say. HappyCow app came up with just one hit – a health food store. No restaurant info has been logged for the town. 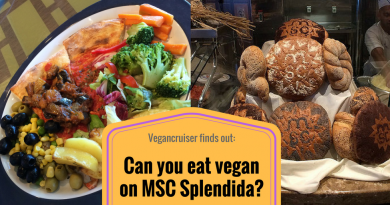 We didn’t need food though, as we had already eaten lunch onboard (brunch in the MDR). Plus we were going to be back onboard the Vision in time for dinner. I did at least get my hubby some Montenegrian (sp?) vegan foodie souvenirs: dark chocolate and spicy savoury potato snacks. The vegan heaven was to come the following day, little did I know. As Vision sailed out of Kotor at 8 pm, us girls were sat in the main dining room, enjoying our food and wine with the last views of the beautiful Adriatic fjord. A great first port of call indeed. Gorgeous! 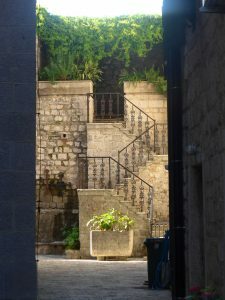 I visited kotor this August and took some gorgeous photos. Very very pretty place. My friend and I were there in Mid May and we never saw children begging. Maybe they were still in school at that point – all I saw was lots of adorable but often poorly feral cats. 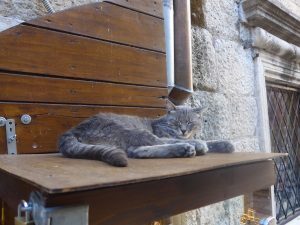 Gotta promise myself to visit Kotor as soon as possible ’cause when fantastic architecture and cats come together it’s nothing but a paradise on Earth. Hey Angie, thanks for reading! 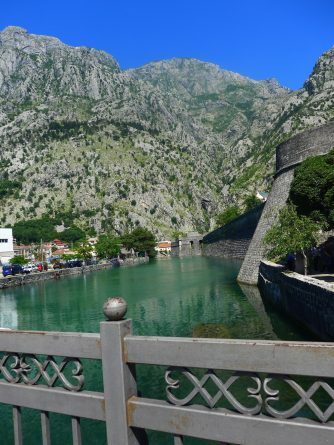 I didn’t know of Kotor either until I booked the cruise. Knew of Croatia but hadn’t realised the split of former Yugoslavia had led to Montenegro forming too. I’ve only been to one cat cafe in my life, and wasn’t too happy with it – cat cafes IMO should be about giving shelter cats a new life and hopefully a new home. Thankfully my own home is a cat cafe with three fluffs keeping me busy. But Kotor? If I go back (when, rather) I will take lots of cat food and treats. I love Croatia too, definitely recommend both! Hi Scarlett, yes, the views were stunning…just sailing in took a few hours and what a lovely few hours it was. Cannot wait to get back! Looks like a great cruise, and certainly a fantastic first port! 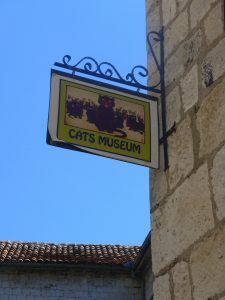 I wasn’t aware of the Cat connection, but I like it! Thanks for sharing on #feetdotravel! Hi Carole, thanks for commenting! IMO there is not really much to do, very small town you can easily walk it.. did you see my blog post on it? I think the turtles on the shore are the highlight but we missed them (other passengers saw them). There are some excursions out but we just went for a quick stroll after breakfast and were back in time for lunch. 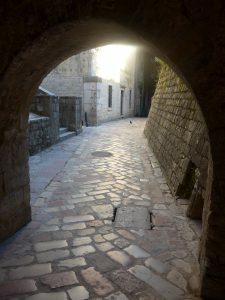 I have never considered Kotor as a travel destination before reading your post and seeing the gorgeous pictures. I am not a cat person but I like to play with them for a while. Ooh! The alleyways look so charming. Kotor seems like a great town. Had never heard of it. Thanks for sharing. The spicy savoury potato snacks sound yummy. 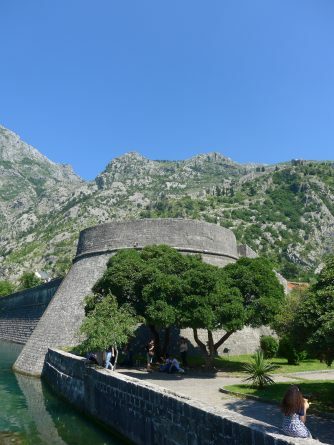 Kotor looks like an amazing town to visit especially the Old Town plus its a UNESCO World Heritage Site. 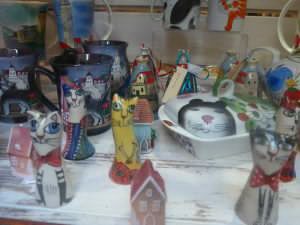 How interesting about the cats all around the town. Great tip to queue up early. Thanks for sharing! 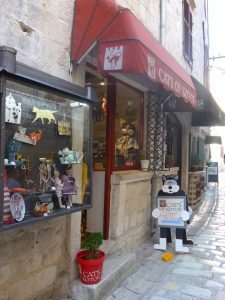 It is a stunning site, smaller and more cosy than Split or Dubrovnik in Croatia but still very much worth visiting. Hope to climb up that hill SOON! Thanks for commenting, much appreciated! 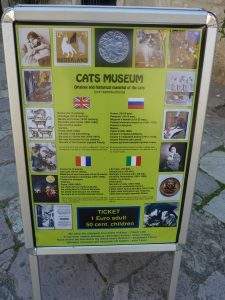 This is a great blog post about this beautiful port, I have heard a lot of good things about Kotor and would really love the do a cruise here, the bay looks stunning in your photo and you had me sold with the Cat Museum! Your lucky to be cruising there again soon.